Marty Bartholomew, was introduced to the sport of fishing at a pretty young age. He's not sure how old he was when he started but the one thing he does remember was NOT catching fish. While still in high school, he carried a 7 ½ ft. Eagle Claw fiberglass fly rod backpacking, and again, never had so much as a little brook trout take a look at the fly. Eleven years after he finished high school, his neighbor Jim Wilborn introduced him to fly tying and shortly thereafter they planned a quick bike ride after work up Waterton Canyon on the South Platte River. Marty has hiked and backpacked into many high mountain lakes and streams and discovered that it requires a few different skills and techniques to master fly fishing for trout at altitude. Listen in to hear Marty share what he's learned. They strapped their gear to the bikes, hopped on, and rode the six miles to Strontia Springs Dam. After thrashing around a while, he was getting the fly on the water and could see it. Then, all of the sudden, there it was, his first trout on a fly! A twelve-inch brown trout. In September of 1986, he got his second chance at fly fishing, this time in Yellowstone National Park. He had bought a cheap rod (not much better than the old Eagle Claw but it was graphite), a couple dozen flies, and a few necessities. While sight seeing around the park, he would hop out and fish a little here and there. After going through a box of flies he felt that if he were to continue to engage in this sport, he would definitely need to start tying his own flies. Four months later, he showed some of his creations to Len Sanders at the Trout Fisher, his local fly shop at the time. Len saw enough potential to put him to work. They struck up a deal to deliver flies for equipment. Marty needed a new reel, so he agreed. It would take eighteen dozen Gold Ribbed Hare's Ears to get a new Ross G-2. Fortunately, the West Denver Chapter of Trout Unlimited had their annual fly tying clinic in February. There he met Dale Darling. It was late in the afternoon before Marty got around to Dale's tying station, but when he got there, Dale was tying a Hare's Ear. Dale gave Marty his first lesson in commercial tying and showed him how to put this fly together in two minutes. Soon thereafter, Marty was teaching fly tying classes at many locations in the Denver area and continues to do so to this day. Marty continued to tie flies professionally, expanding to several shops in the Denver area, to Cold Spring Anglers in Pennsylvania, and Hunter's in New Hampshire. At his peak he was tying 1500 dozen flies per year. He started doing tying presentations and slide shows at the Sportsman's shows in Denver and was on the pro staff with A.K. 's Tool Company, traveling across the country promoting their line of fly tying tools. In there somewhere, he did actually learn how to fly fish. His first book Fly Fisher's Guide to Colorado came out in January of 1998 with broad acceptance and became a life altering event. Since then Marty produced a DVD called Fly Fishing Colorado's Major 6 which came out in winter of 2004. It covers fly fishing techniques for the Arkansas, South Platte, Colorado, Gunnison, Frying Pan, and Roaring Fork Rivers. In the fall of 2006, his next book Tying Flies Like a Pro was released. He interviewed and photographed flies tied by several professional tiers and came up with an outstanding inventory of fly patterns and ideas from some of the country's best. 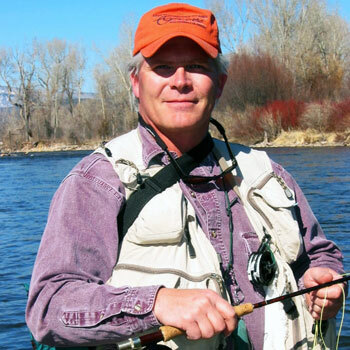 Marty Bartholomew has written stories for Trout, Fly Fish America and Southwest Fly Fishing. He's currently on the pro staff with Ross Reels, Whiting Farms, and Scott Rods.